A shadow is formed where light is 'missing'. A dark shadow (umbra) is formed where no light falls and a light shadow (penumbra) is formed where some light falls, but some is blocked. If the light source is very tiny and concentrated in one place (a point source) only a sharp shadow is formed - an umbra. If the light source is broader light from the top of the source causes a lower shadow than that from the top. You therefore get partial shadow or penumbra as well as umbra. ..... or as you move the object closer or further from the screen. So, why are some shadows lighter than others? 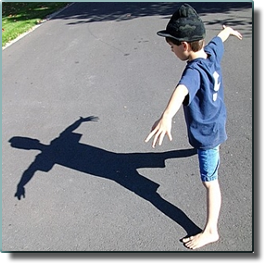 How dark a shadow is depends on the lighting conditions that create it. If there is only once point source of light, then when it is blocked, no light will reach the shadowed area and the shadow will be dark. If there is a lot of reflection, diffuse light, or multiple light sources, however, the shadow will be lighter. On a sunny day, most of the light is coming directly from the sun, but some of it is coming as blue scattered light coming from the sky. This hits you at all angles as it comes from all directions. Therefore, if you stand in front of the sun, the sun's light is blocked, but your shadow still recieves light from the rest of the sky, and you can still see the shadowed ground. On a cloudy day, the light is completely diffuse, not coming from anywhere in particular, and you don't cast much of a shadow at all. Now try some questions on this topic. Click the graphic to go to them.